LoA_Swap for New Heroes in House of Cards! - There are three types of card chests: Common Chests, Deluxe Chests and Mystery Chests. 1 Common Chest costs 50 Diamonds, 1 Deluxe Chest costs 150 Diamonds, and 1 Mystery Chest costs 500 Diamonds. You can get 10 Common Chest for free each day. - You can swap the required cards for: Kungfu Panda (evolved from Panda Nicky), Dragon Queen (evolved from Dragon Empress), Panda Nicky, Dragon Empress, Lunar Priestess, Poseidon, Amazon Hunter, Dark Paladin, Headless Horseman, Lvl.8 Crit+Hit Gem, Lvl.8 Dodge+Hit Gem, Ruby Dragonsoul Pack (W), Ruby Dragonsoul Pack (F),Ruby Dragonsoul Pack (E),Ruby Dragonsoul Pack (I), and many more! - Total Ranking Rewards: At the end of the event, the Top 20 players with at least 5,000 total points have a chance to win Seraph's Stone, Joker (S), Tarot Flip Card (10), Lvl. 8/7/6 Fusion Gem Chests and Lvl. 7 Common Gem Chest. 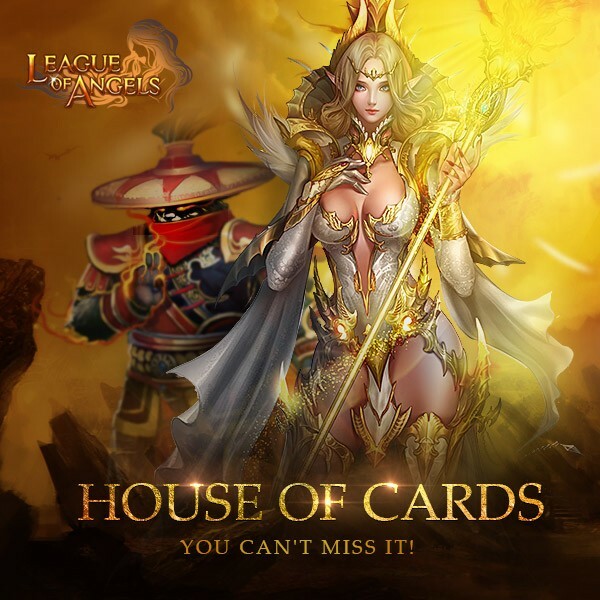 Description: Gain House of Cards points and win rewards! The consumed points will not be counted. Description: Log in every day to win Shell Point Card (10 Pts) and Card Lotto Voucher! Description: Play Tidal Pool every day to win extra Soulstone, Blessed Stone and many other rare items! More exciting events are coming up through Jan. 24 to Jan. 27, check them out in the in-game Hot Events menu now!